To make a backup of your BERN, you simply need to copy the wallet.dat file and store it in a safe place. The file is not large, you can store your backup copy on a different hard drive, a thumb or flash drive, a network drive, a different computer attached to your network, an optical disc like CD or DVD, or a secure non-public cloud solution like Microsoft OneDrive or google Drive. Anyplace you feel safe that you will be able to retrieve it in the event your computer or device you originally store your BERN, for whatever reason, is no longer accessible or functional. 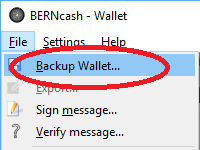 You can simply create a backup from the ‘File’ menu of your BERNcash wallet. You can backup your wallet.dat file yourself. This information also applies if you are running a BERNcash daemon wallet. For the purpose of these instructions, I will be using Windows for example. However; the information within should be easily applied to any Operating System. 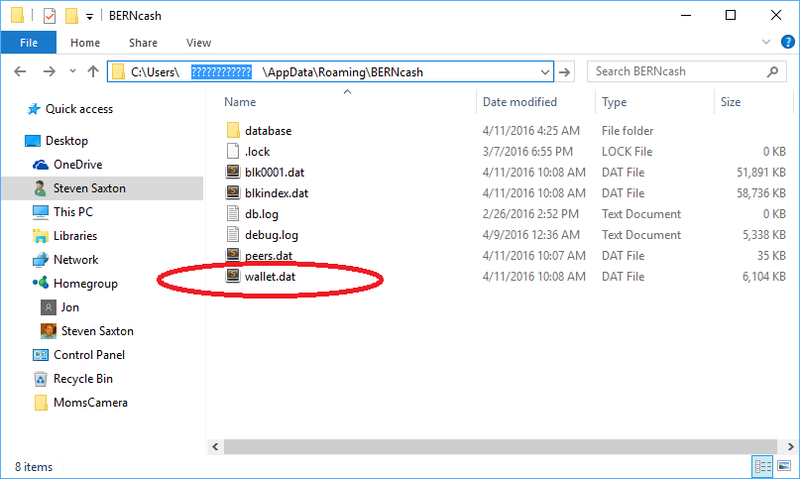 Within the folder, you will see a file called wallet.dat and that file hold all of your BERN. Simply right click the wallet.dat file and select “copy”. Now you can navigate to the backup medium you have selected and paste the wallet.dat file. To do this just go to the location where you wish to keep the backup and then right click inside the folder window and this time selecting paste. You can keep additional copies wherever you wish for added protection and security. Be sure you do not store your backup copies of your wallet.dat file anywhere someone else might get a hold of it. If someone steals your wallet.dat file, they can steal all of your BERN, so be careful where you store your backup. To restore your BERN in the event that you do need to employ your backup copy of your wallet.dat file, you only need to reverse the process mentioned above and copy the backup wallet.dat file back into the BERN folder. This must be done with the BERN wallet application not running. After you have copied the backup into the BERN folder that is pictured above, start the BERN wallet application and allow it to synchronize with the BERN network. Following the easy steps mentioned in this instruction set you can rest assured knowing your BERN are safe and sound even should you find yourself in an unfortunate computing situation.